B2BMX 2018 – THE B2B Marketing event that helps you define your voice. Warm skies, graced by crimson and caramel colored mountain tops, were sparked by inaugural fireworks that greeted 1000 B2B marketers. It was quite the romantic setting for professionals gathering to intimately ground themselves in the latest B2B marketing knowledge the industry has to offer. We awaken Monday morning, excited that President’s Day week will be in sunny Scottsdale, AZ—our redemption to the cold and icy winter that most of us were eager to leave behind. If nothing else, we’d be saved from packing bulky parkas and pashminas. Ok, we didn’t get greeted with the warmth we expected—temperatures dropped close to early 40s with very strong winds. Regardless, I don’t believe anything could have interfered with the amazing energy that resonated in the exhibit hall and speaking sessions. For NetLine, this has become a staple event over the last 5 years, yielding an average of over 1300% ROI. Year after year, we have come to witness how the leaders in the B2B MarTech industry inspire, cultivate, and validate evolving and working techniques to enable novice- to executive-level talent in finding their voice in the otherwise very crowded industry. Humanizing B2B—Putting “Awareness” back in “Brand Awareness”. The DemandGen Report team focused on expanding the idea of allowing empathy to influence marketing tactics, enforcing that we each have a voice in the journey to discovery. Whether that journey be learning more about customers or them learning more about us, there is no shortage of human potential to expanding the customer/vendor relationship. As Brian Solis, Principal Analyst for Altimeter Group, so poignantly said, “The human quotient goes beyond IQ and EQ. It’s the holistic representation of all human potential.” This is something I believe the DemandGen Report team understands and continues to expand yearly. Brian’s general session, “Humanizing the B2B Decision-Making Journey,” hysterically helped us understand the “human” aspects in the B2B buying experience by explaining emotive and personalized approaches. He showed us insights that demonstrate that market disruptions, or triggers, play a part in the buying journey. Identifying triggers, however, isn’t limited to acknowledging external shifts in the market. In fact, you typically don’t need to look too far from home-base to see the major disconnects. The health of your customer portfolio depends not only on how they perceive your services, but how you and your organization understand it to be. There’s a reason why the “Threat” in your S.W.O.T. analysis is often customer perception and internal vision, versus scapegoats like “our competition”. Becoming aware of these triggers that create shifts in market value are quintessential for understanding how to break thought patterns that interfere with brand awareness. No voice is wrong, regardless of experience. 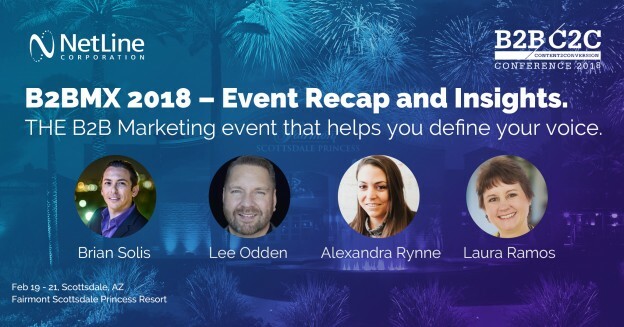 Lee Odden, CEO at TopRank Marketing, and Alexandra Rynne’s session specifically focused on Millennials in their general session, positioning them as the poster children of today’s B2B marketing landscape. The truth is that Millennials embody a work ethic that absolutely challenges the status quo because, quite frankly, they stand for transparency on all levels. Sure, they may have a reputation of being entitled 20-somethings that only want immediate gratification. But they also feel it necessary to discover their life’s purpose by the age of 25. While it may seem that these two attributes conflict with one another, it pushes more seasoned professional to solve for nurturing potential. Millennials consist of 73% of the buying influence and 34% are the decision-makers. It’s as Brian mentioned, potential goes beyond facts and figures. It bridges the gap between what is and what can be and empathy becomes the much needed ingredient to help marketers remain several steps ahead of this underestimated age group. Millennials believe that cultivating relationships through personal touch is “everything,” which is why newer technologies such as real-time interactive content, is apparently the “woke” thing to do in B2B Marketing-land. The question, “How do I become relevant?” seems to be an ongoing unsolved conundrum of sorts. But certainly, less is always more. Both language and the techniques employed to amplify a brand’s voice matter. Customers want to quickly know why your services are relevant, and to understand this relationship, they need context. Laura Ramos, VP Principal Analyst at Forrester, focused on the “what” and “how” in her session, “Empathy: The Hallmark of the Customer-Obsessed B2B Marketer.” Audiences most easily gain context to viable solutions to their problems through unbiased sources and customers’ experiences. Fact-based results, obviously resonate the most. In addition to ensuring marketing content leverages precise, impactful messaging that speaks to the appropriate audience and their needs, the delivery is just as important to supporting the customer’s journey. 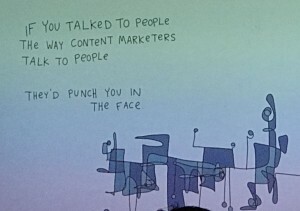 Laura shared examples of the content mapping process to buyer journeys using empathy as a basis for connecting the dots. She stressed that content consumption published in shorter visual formats would ensure you keep audiences engaged, thus more likely to commit to the journey. And where facts may not be accessible due to customer privacy, emulating ROI potential with dynamic content and simulations can help provide the much-needed context that decision makers require to move forward. Nothing says bonding like rubbing elbows with booth neighbors. One of the perks to attending and sponsoring such events are the connections formed from meeting friendly, open-minded and intelligent peers at the exhibit hall. Our experiences are always enhanced when we can share deeper market insights, tricks-of-the-trade, and “war stories” with people who are open to helping and connecting. Our booth location offered us a chance to appreciate the company of PFL, Terminus, Sigstr, and many more. Thanks to you for adding flavor to our experience. We all have come to love Bob Barker’s enthusiasm for inviting show guests to partake in the potential of winning big. Our very own David Fortino, SVP of Product and Audience, borrowed the tune from The Price is Right for our Behind-The-Scene’s session to excite our guests and invite a volunteer to create a live content syndication lead generation campaign. Thanks to Karen Schopp, from UBM’s Content Marketing Institute for participating. With CMI’s content, David was able demonstrate the ease of launching performance-based lead generation campaigns. 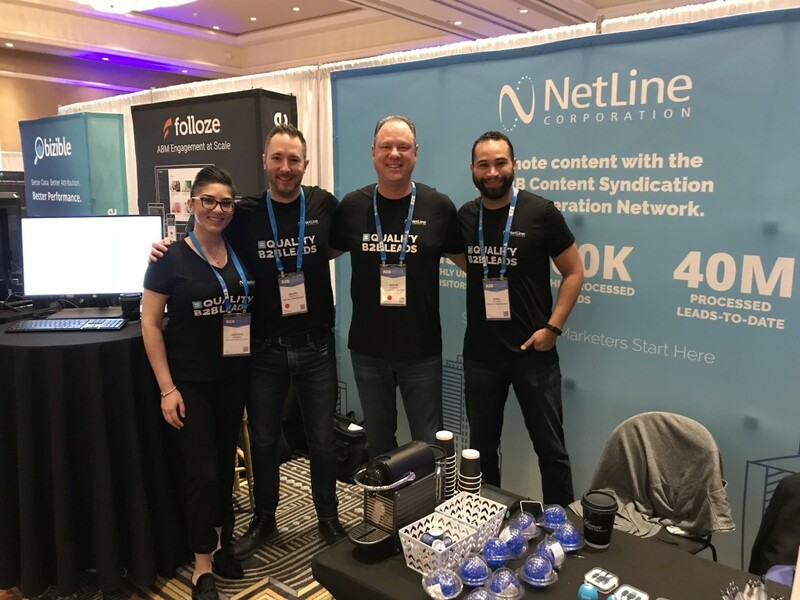 By tapping into the largest B2B content syndication network, NetLine offers marketers from any size company to connect with influencers and decision-makers. To learn more about how we help democratize lead generation for B2B Marketers, connect with one of our lead generation experts. “Democratizing lead gen means any size company can have a voice in the increasingly competitive content universe.” – David Fortino, SVP Product & Audience. Posted by Andrea Neiman on March 19, 2018 .